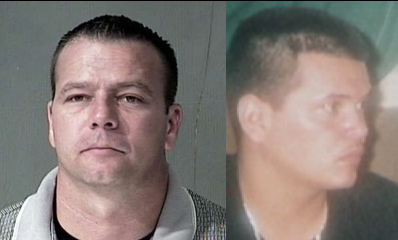 Phoenix killer cop Richard Chrisman (L) and Daniel Rodriguez. The OP-NAT EYE has learned from a source inside Maricopa County, that Phoenix killer cop Richard Chrisman will sign a “no prison time” plea agreement that will either be offered at a hearing this coming Wednesday or soon thereafter. The killer’s trial has been continued (postponed) eight times since October 5, 2010 — the day he shot and killed unarmed, 29-year-old Daniel Rodriguez and his dog. There is currently no trial date set at all in the matter. The source told us Chrisman will plead guilty to negligent homicide with an opportunity to have the charge expunged from his record after completing an unspecified term of probation. This will allow Chrisman to regain employment as a cop in another jurisdiction or even in Phoenix. The City of Phoenix was ordered dismissed as a defendant in the federal civil case Fernandez vs. Phoenix et al. (2:11-cv-02001-FJM) on June 20, 2012. That order is currently being heard by the Ninth Circuit Court of Appeals, according to an April 9 court filing. The estate of Mr. Rodriguez (Elvira Fernandez and Frank Rodriguez; the parents) agreed to settle the claims against Chrisman on March 28, according to court documents. Details of the settlement have been sealed by the court. A separate civil case (2:12-cv-02475-JWS) is still pending against Sergio Virgillo, the “good” cop who witnessed the murder and subsequently arrested Chrisman. Virgillo, the state’s key witness, could have prevented Mr. Rodriguez’s death by intervening after Chrisman shot the dog, according to federal court documents filed by the family. The 240-plus page police report also indicates Virgillo knew Chrisman was going to kill Rodriguez, but did nothing to prevent it. Chrisman responded to Mr. Rodriguez’s request for a warrant before entering his home, “I don’t need a warrant motherfu***er,” according to Virgillo’s account in the police report. Chrisman was indicted for second-degree murder on October 21, 2010 by then-interim, lame duck and opportunist Maricopa County Attorney Rick Romley. Current county attorney Bill Montgomery, who took over in November 2010, is a Joe Arpaio disciple (aka cop-sucker) and regularly makes clear his feelings about Mexican Americans. Maricopa County judges will have the option of sentencing Chrisman to 12 months in county jail or up to 3.75 years in prison, pursuant to sentencing guidelines for a class 4 felony. However, it is believed the court and Montgomery will invoke the “being a cop is a tough job” mitigating factor, pursuant to ARS 13-701(E)(6) and overall American legal culture of encouraging and justifying murder by police. A token 30-day jail sentence is the likely maximum Chrisman will serve.